Gemalto has partnered with ID Quantique to provide high-assurance key protection backed by quantum randomness. The joint solution combines the SafeNet Luna Network Hardware Security Module (HSM) backed by AIS31 validated quantum random number generation. 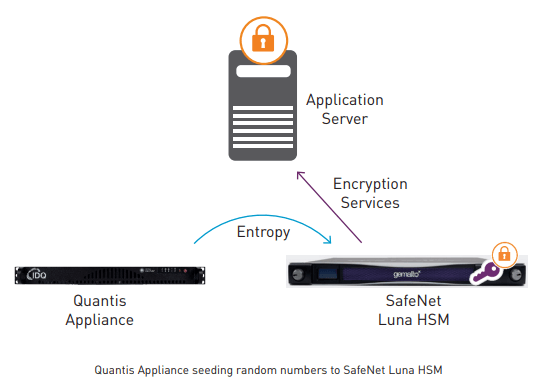 Generating unique and truly random numbers with ID Quantique’s Quantis Quantum Random Number Generator (QNRG) appliance, together with Gemalto’s SafeNet Luna Network Hardware Security Module (HSM) high-assurance key protection appliances, is a powerful combination to securing an enterprise. This high entropy and secure key storage solution addresses critical applications where high quality random numbers are absolutely vital such as: cryptographic services; numerical simulations; cloud; compliance; gaming; and IoT-scale device authentication and managed end-to-end encryption.